Another gorgeous cover revealed. Saving me from having to do a real post. AWESOME! 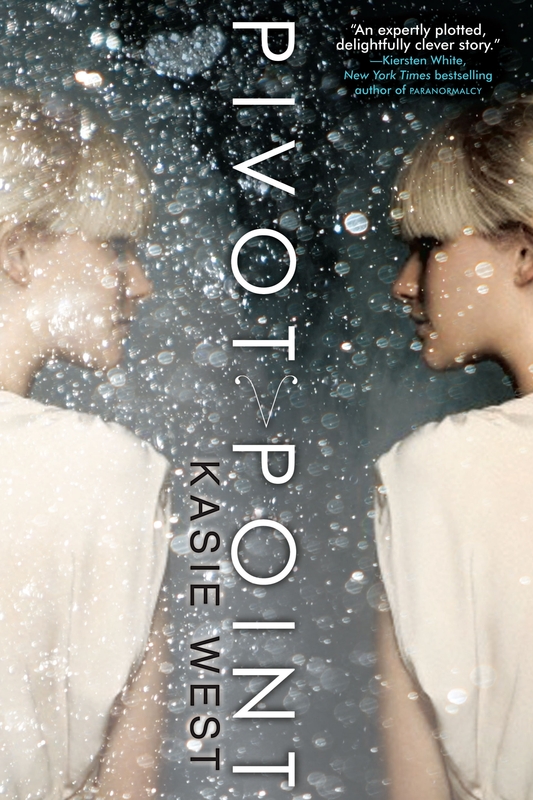 So I first mentioned Kasie West and PIVOT POINT sort of vaguely here, when I mentioned how I was feeling kind of overwhelmed and I had just taken on a few new clients and I wasn’t really thinking that I should take on any more that second, but I read PIVOT POINT, and I reread it, and I pretty much knew that if anyone else represented it I would be so jealous I’d want to claw their eyes out. I decided that was going to be my new standard for deciding to represent clients: the claw-another-agent’s-eyes-out test. Do you ever get the feeling that I take the “Wolf” part of “Wolf Pack” a little too seriously?? ANYHOO, I think I scared Kasie into signing with me and the rest was history. There was a fierce claw your eyes out battle between editors for PIVOT POINT too, before we settled with the lovely you’d-never-believe-she-would-claw-anyone’s-eyes-out Sarah Landis at HarperTeen. Hey, how come people believe I would do that??? And la la la, here we are with possibly one of the most gorgeous covers I’ve ever seen. I know I say that for all my books, but damn, we get good covers. Addison Coleman’s life is one big “What if?” As a Searcher, whenever Addie is faced with a choice, she can look into the future and see both outcomes. It’s the ultimate insurance plan against disaster. Or so she thought. When Addie’s parents ambush her with the news of their divorce, she has to pick who she wants to live with–her father, who is leaving the paranormal compound to live among the “Norms,” or her mother, who is staying in the life Addie has always known. Addie loves her life just as it is, so her answer should be easy. One Search six weeks into the future proves it’s not. In one potential future, Addie is adjusting to life outside the Compound as the new girl in a Norm high school where she meets Trevor, a cute, sensitive artist who understands her. In the other path, Addie is being pursued by the hottest guy in school–but she never wanted to be a quarterback’s girlfriend. When Addie’s father is asked to consult on a murder in the compound, she’s unwittingly drawn into a drawn into a dangerous game that threatens everything she holds dear. With love and loss in both lives, it all comes down to which reality she’s willing to live through…and who she can’t live without. Doesn’t this book sound A-MAZ-ING?!?! I KNOW!!! I mean, I do know, but still, tell me in the comments how much you want me to do some kind of contest for an ARC or something and maybe I’ll figure out how to do that. In the meantime, you can also check out Kasie’s blog for blurbs and more good stuff. Well dang it! Now I’m dying to read it!! Pretty please do an arc contest! If you don’t, I just may claw MY eyes out! That is a lovely cover! I wish traditional adult romance covers would take note of the YA covers and evolve a bit. I love it…*whispers in ear* Wolf Pack ARC tour please…. I don’t think you would claw anyone’s eyes out. You’re too nice. But I do like your how to tell if you should represent someone test. The first time I saw this I thought it was the whole jacket, front and back, and now I realize it’s the front cover. Even better! And yes, I think you’re an eye-clawer when you have to be and I wouldn’t have it any other way!! Yes, this is the front cover only. It’s fabulous, right?? Eye clawing is nothing less than awesome. Beautiful cover… scintillating blurb…. I WANT IT! !